The group hit the stage at 8:20 PM. The set was the same as past shows. The sound was fantastic. During Siberian Khatru, Steve Howe played an incrdible extended solo that set the pace for the evening. He really shined on America as well as Starship Trooper. After the Steve Howe acoustic solo, Jon came on stage and imitated Steve and the crowd broke up. The threater was the perfect place for a Yes show. Not a bad seat in the house. Everyone in the group (except Sherwood) played very good and appeared to be having fun. Billy Sherwood looked lost up there. The keyboard layer played good but I would have like a long Wakeman solo..oh well. 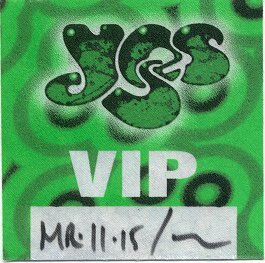 Overall it was the best Yes show I have seen. I hope they play something from GFTO on the next tour. YES, it was a show that definately will be remembered! A packed house @ the Riverside Theater in Milwaukee was treated to one spectacular 2 hour & 45 minute show last evening, w/ more than usual zest & intensity from the band members. I'm sorry but I can't provide you w/ the actual set list but it was pretty much the same as the standard as best I can remember. We the fans were all one big family during last nights performance, like kids receiving candy or gifts @ Christmas as each successive song brought smiles to our faces & gleam to our eyes! When the guys are having that much fun up there, you really begin to appreciate the talent they display. The comaradery was definately there, as they were enjoying the performance as much as we were! One heck of a light show, as someone was really thinking w/ this new set-up. The amount of lights were compounded by the effect of precisely arranged reflecting sheets that gave the effect of a well saturated color umbrella! The sound was up to par for the most part, as the Riverside has the best acoustics in town IMHO. Chris Squire was having a real ball up there on stage w/ lots of stage precense, w/ an elevated level of energy as he "danced" the floor area like a............"Fish out of Water"! He performed what I thought was the best bass solo I've ever seen him perform, w/ volume level louder than normal! Jon Anderson's voice was the ever present angelic voice as we all know him for! Alan White pounded his heart out on those skins, w/ a very impressive solo choreographed to a highly technical barage of computer assisted lights! Steve Howe........well what can one say of a "true" master of the guitar in all forms! Wether it be steel guitar or acoustic, Steve hasn't any peers in the style that he dominates! His huge array of guitars allows for an ever changing sound which compliments the many technical approaches that he displays. Billy Sherwood on lead/rhythm guitar, backing vocals, adds a christening touch to the fuller sound that now is heard. Billy has brought alot of experience & know-how to a group that only benefits from his addition! And last but not least Igor on Keyboards..........this guy is a force to be reckoned w/ as he was more than capable of taking the helm in this department! There are so many layered sounds w/ keys in the traditional music of YES, & I feel Igor really kept w/ that tradition & is yet another great keyboardist to be added to the ever growing list of talented individuals to have filled this spot! For me as well as others, Starship Trooper was the iceing on the cake as it was a terrific rendition of an age old classic, that capped off an already splendid evening! After the show a handfull of die-hard fans & I braved the very bitter cold wind for a good hour for the chance to possibly get a glimpse of & an autograph from the guys. During the course of that time we were able to have Steve, Alan, & Chris secure us that hope, as they took the time to sign a few things, shake a few hands & receive the compliments we bestowed upon them! A wonderfull end to a brilliant evening w/ YES!!! Alot of people will have many memories to tide them over until we may someday be graced w/ such musicianship & kindness once again! Milwaukee was INCREDIBLE! The crowd was tame (sit-down), but from both a performance and production standpoint, the show was flawless, even better than the previous two. JR's mix was great; for the first time, I could feel the bottom end in my chest cavity! It should have been recorded for a live album and video. I thought they would have slacked off after an incredible night in Rosemont (and this being the last of a long stretch of nights), but au contraire! Steve was happier than ever; Igor was "on" again too. (BTW, he walked, alone, by us who were waiting outside the stage door after the show but no one wanted his autograph. I did, but he caught me by surprise, so I just yelled out "you're great" or something to that effect.) It was good to finally hear "Masquerade."